In this article you’ll learn about the research that proved the link between smoking and hair loss. You’ll learn the reasons it happens, and you’ll learn exactly what to do to recover from (or alleviate) the effects of smoking on your hair. Is There Evidence That Smoking Causes Hair Loss? Two significant studies have been conducted so far, investigating the link between hair loss and smoking. Both came to the same general conclusion; yes, smoking does cause hair loss. Or to put that in scientific jargon, there is “a significant relationship between smoking and baldness” as the 2003 study stated. 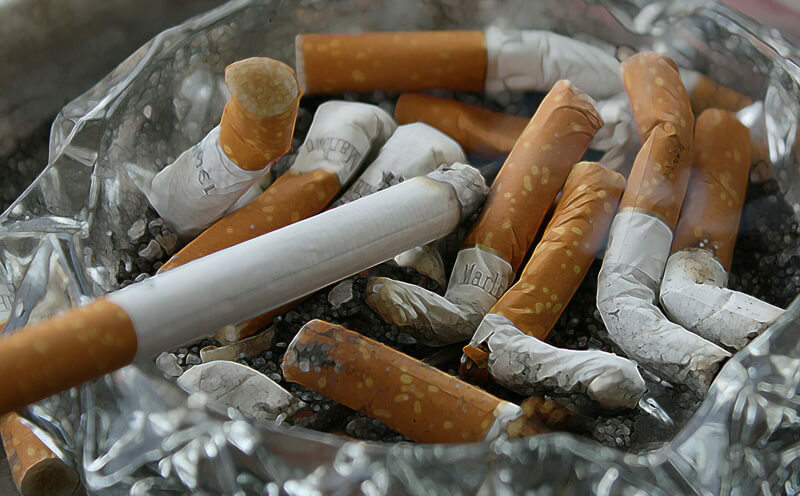 Both studies conclude the reasons for smoking as a cause of hair loss as multifactorial, meaning there are more than one reason that smoking would go on to cause hair loss, speaking from a biological perspective. The effects of cigarette smoke on the microvasculature of the dermal hair papilla. Genotoxicants causing damage to DNA of the hair follicle. Smoke-induced imbalance in the follicular protease/antiprotease systems controlling tissue remodeling during the hair growth cycle. Pro-oxidant effects of smoking leading to the release of pro-inflammatory cytokines resulting in follicular micro-inflammation and fibrosis and finally increased hydroxylation of oestradiol as well as inhibition of the enzyme aromatase creating a relative hypo-oestrogenic state. You may not necessarily want or need to understand the scientific jargon to come to the conclusion that, through various mechanisms, we can be fairly confident that smoking will cause or speed up hair loss. Sure, there are plenty of people who smoke who don’t suffer from pattern baldness, but that’s beside the point. I personally used to smoke socially now and again but have given up because I was worried it was affecting my hair. Smoking is associated with premature ageing. Hair loss is also associated with ageing, so it makes sense that smoking and hair loss would be connected in some way. Toxins entering the body through the lungs from polluted air, plus the damage from free radicals are two ways that smoking causes premature ageing. Does Nicotine Contribute to Hair Loss? There are various ‘ingredients’ found in a cigarette, but perhaps the most well known is nicotine. This substance belongs to the nightshade family, and it makes up 0.6% to 3.0% of tobacco’s dry weight. But the question is, does nicotine play a role in hair loss? It doesn’t directly cause hair loss, but it does lead to poor health. These can indirectly contribute to hair loss. How? Foremost, nicotine decreases oxygen levels. With less oxygen to go around, there’s less that will be delivered to the scalp and hair follicles. This is because vital organs, such as the heart and brain, must be supplied first. Nicotine also lowers immunity, which can be a trigger for individuals susceptible to Alopecia Areata (AA). It can also lead to the development of many scalp conditions, such as dandruff and seborrheic dermatitis. This substance can also increase blood pressure and age the skin. Increases cortisol (stress hormone) levels. Does this all mean you should stop marijuana use altogether? These can reduce the effects of marijuana on your hair follicles, but it won’t remove the risk entirely. What Can You Do About Smoking-Related Hair Loss? Aside from giving up smoking there are a few things you can do to alleviate and recover from the effects of smoking on your hair. If you can’t give it up, then these techniques will help combat the side effects. For those suffering from pattern baldness, deep breathing exercises can be extremely beneficial. There are three main reasons for this. Firstly, deep breathing is an extremely effective way to relieve stress and reduce your cortisol levels. It activates the parasympathetic nervous system (rest and digest) rather than the sympathetic nervous system (fight or flight) that helps overall health and longevity and promotes healing and recovery. Secondly, breathing increases oxygen levels dramatically, which in turn helps provide the raw ingredients needed for hair growth directly to the scalp. Thirdly, deep breathing helps shift the acid/alkaline balance towards the alkaline end of the spectrum which makes a big difference to hair loss. Acidic blood increases the conversion of testosterone into DHT, conversely alkaline conditions inhibit the enzyme 5-alpha reductase, reducing DHT levels in the scalp. High carbon dioxide levels are associated with blood acidosis which is an absolute killer for hair follicles. Regular excise can help you recover from a smoking habit by increasing lung capacity and red blood cell count. Many smokers find exercise very hard because their lungs are damaged and heavy breathing is painful and cause coughing. You’ll need to stick with it to purge the lungs and speed up the removal of tar. Swimming is an excellent exercise for this; it trains lung capacity, it’s low impact (making injuries less likely), and it exercises lots of different muscles in the body which is great for overall fitness. House plants have been shown to increase air quality in the room, whilst also providing higher oxygen levels, both of which will help. You may also want to try other ways to increase the quality of the air you breathe on a daily basis. If you live in a polluted city, installing in-house air filters might be a good move. I smoked for 37-38 years and did not lose a hair. After I quit smoking, I started losing gair en masse. Unbelievable really. 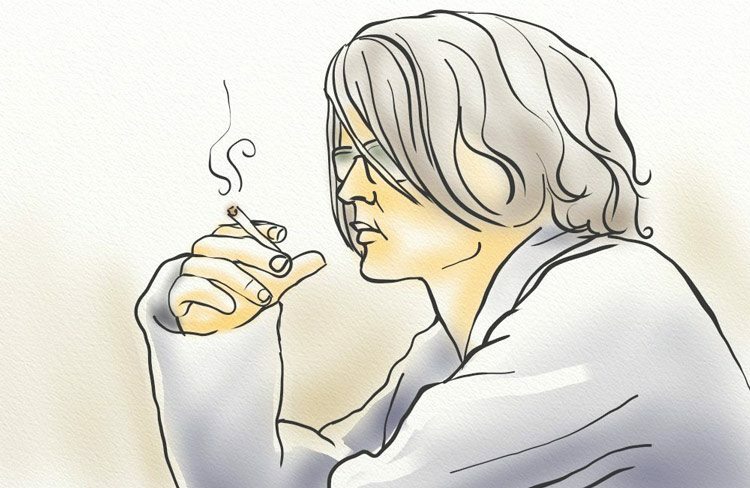 Nothing changed in my daily life except not smoking anymore, I ate the same things in the same amounts, did my regular exercise and sports. Can’t think of anything else that may have cause massive hair loss.